When we think of the impact that brain injury has on a person, it is often the ability to process, record and recover information that comes to the forefront. We focus on the thought processes or problems in memory first, and the emotional aspects of brain injury last. However, depression is a significant and debilitating factor in many brain injuries. According to the Brain Injury Association of America, significant depression will affect 6 out of 100 people in the general population. However, research has found that if TBI is involved this number may increase by ten times. Lack of inhibition and compromised frustration levels can affect a brain injured individual’s ability to control anger. The same mechanisms can affect an individual’s emotional responses on many levels and emotional responses may become exaggerated or inappropriate. Depression, however, is not only triggered by the physical changes in the person’s state. Whether depression is triggered by the inability of the brain to cope with emotional signals or environmental changes which occur as a result of decreased functioning or whether it involves an actual chemical change in the brain, depression is a serious issue which needs to be addressed. Individuals who were exceptionally high functioning before an injury occurred are often at a higher risk for depression because of their inability to achieve pre-injury functioning. A lack of ability to stay on task due to lower frustration levels, inability to multitask and diminished stamina can all contribute to a feeling of worthlessness when measuring themselves against their former selves. This process becomes a cycle between frustration and anger which can isolate the individual from previous social interactions. It is accepted by the medical community that a feeling of being a burden on others and not being of value in the world can lead to suicidal ideation. When a formerly high functioning individual is placed in a situation which makes them dependent on a caregiver and removes them from pre-injury productivity, it can become a severe blow to self worth, which can lead to depression. 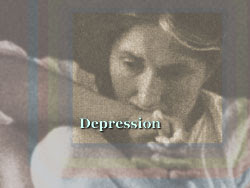 Depression is a highly treatable condition which requires admission that depression is present. This may or may not be possible if the brain injured person has no self awareness about their own emotional functioning. It is important that family members and caregivers understand the signs and symptoms and what they can do to help. A brain injured person is more likely to self-medicate with alcohol and drugs in an attempt to cope with the changes which have occurred. Because they have a compromised system, they are more vulnerable to the use of substances which can escalate the problem. These issues may need to be addressed as well with a knowledgeable professional experienced in treating brain-injured individuals. There is an excellent brochure available from the Brain Injury Association entitled “Coping with Depression after Traumatic Brain Injury” which describes the factors which may lead to depression and what the survivor and family can do to manage depression.